Llyfr Taliesin (Llibre de Taliesin), foli 13r (facsímil publicat el 1868). Taliesin (vers 534 - vers 599) fou un poeta gal·lès del segle VI, el més antic dels coneguts. Pertanyia al grup dels Cynfeirdd (bards primitius), cantà l'edat heroicoguerrera de Gal·les i elogià el rei Cynan Garwyn i al príncep Urien Rheged. La seva poesia dramàtica mostra que el gal·lès era emprat com a mitjà artístic en aquesta etapa primerenca de la seva història lingüística. La seva obra és recollida al Llyfr Taliesin (Llibre de Taliesin). Ford, Patrick K. 1977. The Mabinogi and Other Medieval Welsh Tales Berkeley: University of California Press. Ford, Patrick K. 1992. Ystoria Taliesin University of Wales Press: Cardiff. Ford, Patrick K. 1999. The Celtic Poets: Songs and Tales from Early Ireland and Wales Ford and Bailie: Belmont, Mass. Haycock, Marged. 1997. "Taliesin's Questions" Cambrian Medieval Celtic Studies 33 (Summer): 19–79. Haycock, Marged. 1987. "'Some talk of Alexander and some of Hercules': three early medieval poems from the 'Book of Taliesin." Cambridge Medieval Celtic Studies 13 (1987): 7–38. Haycock, Marged. 1987–88. 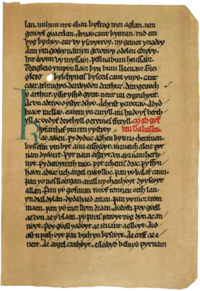 "Llyfr Taliesin," National Library of Wales Journal 25: 357–86. Haycock, Marged. 1983–1984. "Preiddeu Annwn and the Figure of Taliesin" Studia Celtica18/19: 52–78. Koch, John and John Carey. 2003.The Celtic Heroic Age 3rd ed. Celtic Studies Publishing: Malden, Mass. Matthews, John. 1991. Taliesin: Shamanism and the Bardic Mysteries in Britain and Ireland Harper Collins: London. Williams, J. E. Carwyn. 1987. The Poems of Taliesin Dublin Institute of Advanced Studies: Dublin. La pàgina va ser modificada per darrera vegada el 13 jul 2018 a les 16:47.